The numbers are in and UKIP has managed to field 1,727 candidates in the May elections - only 33 less than the Limp Dems. 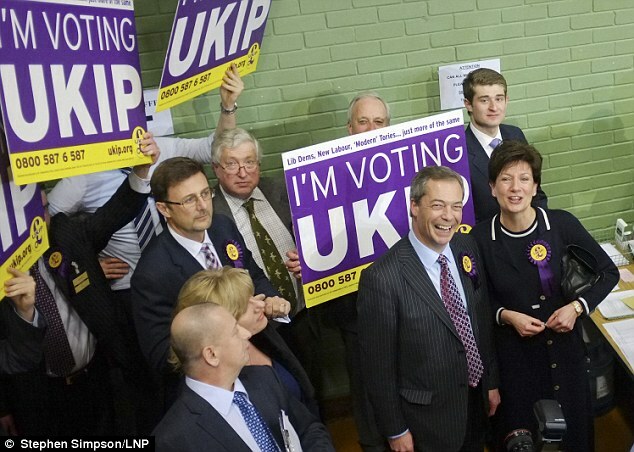 The last time these same elections were held in 2009 UKIP had just 593 candidates. We patted ourselves on the backs at getting such an unprecedented number of candidates at the time and were disappointed but satisfied with gaining 8 councillors and finishing second or third in almost every seat we contested. How times have changed. We're now looking at nearly three times as many candidates and expecting a lot of them to win. In the last five weeks we've had five by-election wins - this has never happened before in the party's history and it bodes well for next month. If tribal voting wins on May 2nd it won't be through lack of trying on UKIP's part. The extremists aren't doing too well this time round with the Greens fielding just 877 candidates, the BNP fielding 100 and the English Democrats 29 with an ongoing investigation into their Kent candidates list which includes some dubious names such as "Anna Cleves" who apparently lives near Anne of Cleves Road in Dartford and "Steves Uncle" who, according to the nomination papers, lives with a relative of their local organiser and candidate for Swanley division, Steve Uncles and Eastleigh flop Mike Walters.